Healthy living and eating has never been so simple with new Lettuce Jammer Wraps™. 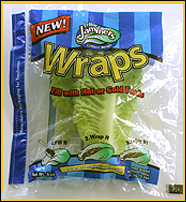 Lettuce Jammer Wraps™ are pre-washed and ready to eat in a resealable bag. These sweet tasting, healthy wraps are a cross between Iceberg and Romaine lettuce — making them BIG and STRONG enough for hot or cold fillings. They have Vitamin B6 and fiber — but almost no carbs. Make a HOT Taco Lettuce Jammer Wrap with no tortilla - Try tuna, chicken or egg salad - put your favorite barbecue in a Lettuce Jammer Wrap OR make a BLT - with no bread!